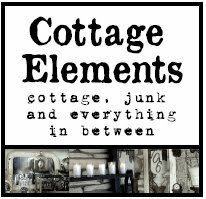 Cottage Elements: A Country Junk Sale! Heads-up to all who live in the Minneapolis/Twin Cities Metro Area or are in need of a road trip. It's time for another Country Junk Sale in Monticello, MN. 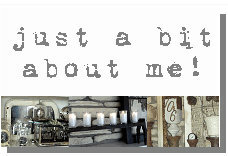 I was thrilled to be able to get a sneak peak to share with you. And I'm telling you, with all the stuff there, it's worth the drive. 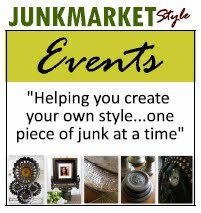 Located at 9650 Harding Ave. Monticello, Minnesota it opens on Friday, June 25 from 9:00 to 5:00, and on Saturday, June 26 from 9:00 to 12:00. I'd be sure to get there early. Here's a look at what's in store. Rakes, rakes, and more rakes. Crates, crates, and more crates. Getting the picture? Lots and lots of multiples. How about some cream separators? You'll find lots of furniture. In fact, there's a whole driveway full! Here's a couple of extra cool pieces. And if you know me, when there's cats to be found, I'm there. Feel the cat love? Someone wasn't all too happy with me, as she was bored! And then I was wondering why my phone went dead? Someone was playing games on it. Ahhh....she needs to learn to be a better junker! And then we have a lot of miscellaneous smalls, too! Here we have just a couple of farm girls! And then we have our gracious hosts, Larry and Cindy Moore. Thanks for the great tour! Looks like a great sale, wish I could be there. I won't be THAT far away....I'm visiting my Brother and SIL in Des Moines. Now if I could only convince them to go to the sale with me! Wow, you are definitely hitting all the good junk spots this summer. The two of you look right at home on a tractor! Cream separators make the loveliest garden planters, full of hanging plants.. I would be crazy trying to decide..my kind of junk..thanks for the tour! Oh, looks like my kind of sale! I think I need to live closer to MN! Looks wonderful, wish I lived closer. Looks like a great place for the unusual find. Looks like my kind of junk! Too bad I don't live closer or I'd be there. I love these kinds of sales. I love crates...fun trying to picture what was shipped in them! I wish that I lived in an area where you could go on treasure hunts like this!!! Just love it!! I want a cream separator. Did you play with the cats?